Eugene C. Price was born in Silverton, Oregon in 1956. His mother had platted and named the town of Silverton. Price spent his youth in Salem and is said to have learned the construction trades in The Dalles, Oregon. While there in 1881 he married Viola McFarland of The Dalles. He had no formal architectural training but instead learned on the job. 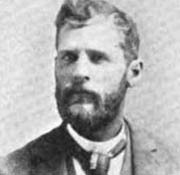 Over the course of his career he reportedly he practiced architecture in Portland, Oregon; Butte, Montana (1898); Eureka, California; and Ellensburg. Price lived in Ellensburg from 1888 to 1894 and reportedly had a very busy architectural practice after the disastrous fire of 1889, however to date just one building in Ellensburg to date has been verified as designed by him. Per advertisements, Price was in partnership with W. Rhoads and together they offered to “construct all kinds of buildings.” Together the partners also owned and operated the Enterprise Planing Mill Co., manufactures and dealers in lumber, shingles, moldings, lime, cement, brick and just about anything else you needed to build a home or business. Reports indicate that the “attractive appearance” of the city was attributed in large part to Price’s suggestions, which were closely followed in the rebuilding of the city. Specific references to his exact recommendations have not been located to date. His only verified project in Ellensburg is the imposing main building at State Normal School (now known as Barge Hall, 1894). From 1908 to 1917 Price worked in The Dalles office of Charles J. Crandall, his cousin. When Crandall died in 1917, Price took a job with architect Charles N. Burget. Burget may have also worked at one time for Crandall, since both he and Price claimed to have worked on the design of the Wasco County Courthouse (1914) in The Dalles. Price continued an independent practice in The Dalles until 1927, at which time he retired to Long Beach, California. By 1931 he was back in Oregon and died in Portland in February 1933 while on a trip to visit his daughter. The Oregonian’s Handbook of the Pacific Northwest, The Oregonian Publishing Co., Portland, OR 1894. Obituary – Polly L. Price, Hood River Glacier, Oct 28, 1898. Pg 2. Ritz, Richard E. Architects of Oregon, Lair Hill Publishing, Portland, Oregon, 2002. Advertisement - The Ellensburh Capitol, Dec 27, 1888.